Automation vs. Being a Human (aka what you can and can't automate) — Lauren Myers & Co. 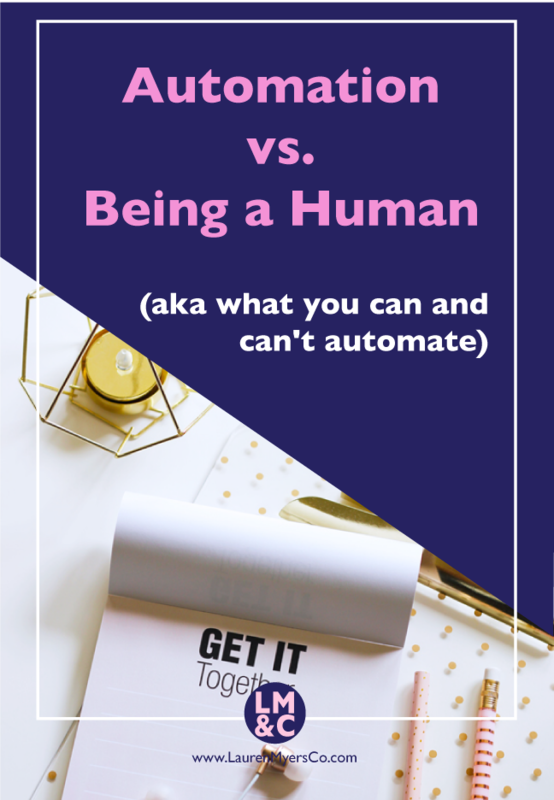 Automation is one of the main topics that I blog about and it has been the biggest thing that has helped to keep me on track. It’s mostly because of the trickle down effect- automate things to free up time to do things that you can’t automate. I try to automate as much as I can, but I still stumble upon things that I need to touch. You may wonder what you can and can’t automate, so here is the tea. Social media is something that is necessary when you have a blog or business. You need to have different ways to reach your audience, and social media is an easy, free way to do so. Unfortunately there are so many different platforms out that you can get confused on which to focus on and how to stay active on them consistently. This is where automation comes in. There are plenty of platforms that focus on social media automation (posting for you on the schedule that you choose), or you can create your own automated task using Google Sheets and Google Calendar (this is the method I use when scheduling my twitter posts). You can schedule posts for Twitter, Pinterest, Facebook and so much more. You can even schedule Instagram posts now through Hootsuite (Instagram was the only platform that didn’t allow automatic posting until now). This doesn’t have to stop with blog content, you can also schedule social media for new podcast episodes, vlogs, soundcloud playlists, etc. Email lists are important for many reasons, but one of the most important is that you can tag and segment subscribers based on their actions, engagement and other criteria. For example, in ConvertKit, you can tag a user if they click a specific link in an email that you sent. You can also segment members based on interest, date added to your list, location, etc. The beauty in this is that you no longer have to send blanket emails to everyone on your list- you can just send focused content to people that have already expressed an interest in a topic in the past. This in turn tends to increase your open and engagement rate. Tagging and segmenting can be done through automated tasks, so you don't have to keep track of this or try to remember to do it yourself. So as an example, when someone purchases a product from me, they are automatically tagged as a customer for the product purchased and tagged as interested in the topic related to the product. This way, if I create a new product related to their previous purchase, I can email them directly to let them know about it because they have already shown an interest in the subject. Digital products + services/coaching: Create email funnels that ultimately sell your digital products or services, run Facebook ads, run a sponsored Instagram post or promote a Pinterest pin. All of these strategies run behind the scenes and are your cheerleader when you don't have time to be a cheerleader for yourself. Physical: Yes! You can even automate the process of selling tangible products. Dropshipping is the way to go. Dropshipping is when you create a design and submit the file to a printing company that will print your design onto a blank product. For example, you may want to sell t-shirts but may not want to carry the inventory or know how to print the shirts yourself. You also may not want to deal with shipping. By using a drop shipper, they will take care of the printing and fulfillment (shipping), so you just create designs and they do the rest. Of course they get a cut of your sales, but it’s more economical because you don’t have inventory, printing supplies or shipping to worry about. One large thing that bloggers and entrepreneurs find difficult is coming up with ideas for blog posts, emails and products. In order to find out what your audience struggles with, you need to do some market research...but I quickly discovered that research takes time. As a result, I found a way to automate market research, so my search results are all saved into a spreadsheet and I can look for content ideas at my leisure. Here’s a post about that and how to set it up. Ideas are always floating around our heads and it can seem impossible to organize them on the go...especially if you're driving and can’t stop to jot it down. Your Notes app can only take you so far, but Evernote is where it’s at! You can automate the process of organizing your thoughts and ideas with the click of one button. Here’s a post about it and how to do it. This is when you familiarize someone new with your processes, products, services, etc. Onboarding isn’t just for new employees at an organization, it can also be used in blogging and solopreneurship. Email list welcome sequence- this type of onboarding is when you welcome a new email subscriber to your crew and provide more information about you, your blog and what they can expect from being on your list. You can also send a few emails over time (a sequence) with helpful tips or blog posts to get them more familiar with you and your blog/biz. New client/customer welcome sequence- this type of onboarding is when you have a new coaching client and email them a welcome packet including what their next steps are and what they can expect for the duration of your coaching program. For new customers, your welcome sequence can tell them the best ways to use your product, share how others have used the product and tell them a social hashtag that they can use to share with their followers. You can also encourage them to purchase again by sharing coupon codes for future purchases. If you have a separate account used for blogging/business, you can easily link that debit/credit card to your accounting software so that all business purchases are automatically tracked and placed in the correct category for business tax purposes. This takes the guesswork out of filing taxes and keeps your accounting process streamlined and organized. You can automate typing my friend! Have a long blog post to create and just no time to sit there and type it all out? Utilize your voice-to-text features on you phone instead! If I’m really strapped for time and need to work on a post, I use the Google Docs voice-to-text dictation feature to talk my blog post out. It works wonders! Analytics are important to view for your website because they tell you so much (who’s visiting from where, when, how long they stayed, how they found you, are they a returning visitor, etc.). Rather than stalking your analytics manually, create a scheduled report to be emailed to you with Google analytics info. I have a weekly and monthly report emailed to me and it has really helped me see what’s happening on my site and the areas that need improvement. If you can't (or don't want to) stay in your email all day but want to be notified every time someone purchases one of your products or sends a message to you through a web form (or any other important email), you can be notified when these things happen rather than having to stalk your email. Either push notifications or text notifications can be sent. The great thing about this is that you don’t have to constantly check your email which tends to take people away from the task that they were trying to complete in the first place. If you use a Gmail account for your blog, you can create email response templates (Canned Responses) for questions that you receive frequently. Rather than typing the same thing each time, you can insert your canned response into the email body and send it off! Being genuine requires a human...people don't want to engage with a robot and it’s easy to sniff out a disingenuous comment. You post an image of your breakfast and the comment says “I love your outfit!” or someone just comments with random emoji's. Nicole Walters quoted, and I love it so much, “We are in the business of people. And we automate our systems, not our relationships”. With the constant algorithm changes on social media, they are forcing us to be more human and interact with one another again...and that's not a bad thing. You can search automatically for ideas of what to make, but you have to create the content yourself. Whether you are designing logos, coding websites, offering styling services or are a beautician, you have to be present to create. This is the fun part anyway! This is what you are making room in your schedule to do by automating what you can elsewhere. Someone has to be there behind the lens to capture images. You can't automate a photographic eye. Someone also has to choose the best photos to post, edit them and place them on your website or blog posts. Again, you can automatically find content ideas, but you have to organize/plan things so it all comes together. 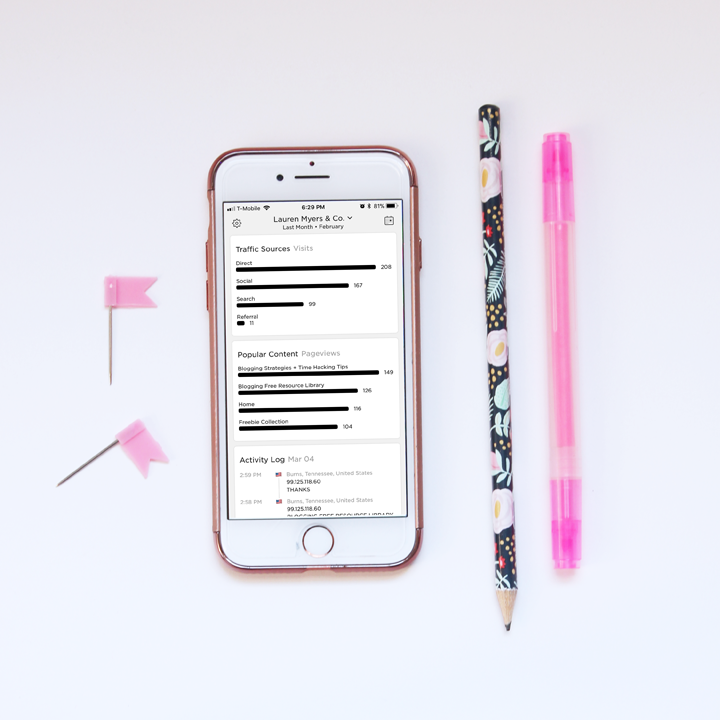 You can plan your Instagram feed using the UNUM app and plan blog/biz contents in Asana, Trello, or any other project management tool. If a customer has a problem the last thing they want to do is talk to a bot. Human interaction is a necessity when dealing with customer service issues. This can be through email or on the phone, but either way, it needs to come from a human and not use canned responses. I realize this is also something that I mentioned earlier that you can automate, but some responses cannot be handled by a bot. 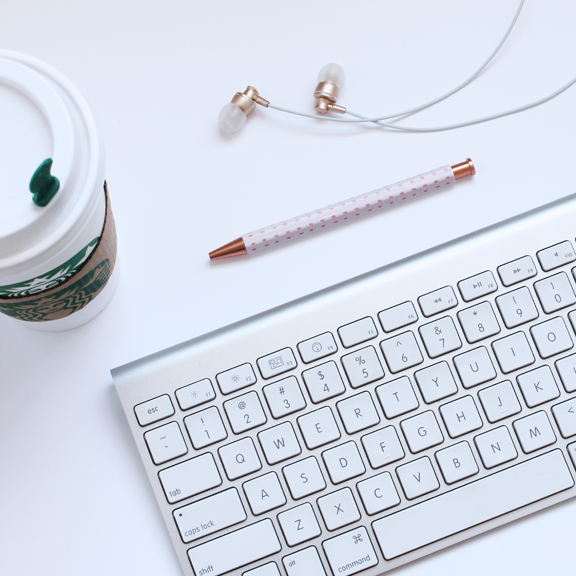 You need to be present to respond to emails from people wanting to collaborate, commenting on your blog posts, asking about something you sent in an email to your email list, etc. Canned responses can only take you so far. When someone receives a response to an email that they sent to you, especially one that they KNOW is genuine, it makes a huge difference and can make them LIKE and TRUST you more (yep, that whole know, like, trust factor). Now that you know what you can and can't (i.e. shouldn't) automate, where do you see yourself shaving time off of your day?